Connects to itself for bundling items together like pipe, lumber and more. Slip one or more of our optional E-Fittings on strap and connect to "Snaplocs" (E-Track Singles) and E-Track. Long 8' length heavy Duty 2" wide Polyester strap webbing. It's not just a Dolly, it's a Tool! Our "4 Tools-in-One" design provides you the option of adding bars turning your Dolly into a Platform Truck, Panel Cart and an Inter-Connected multiple Dolly platform helping to move anything faster and safer. The Snap-Loc Dolly crushes all competitors dollies with its many unique features: 1,500 lb capacity with super heavy duty swivel casters allow you to move heavy loads with little effort. Caster brakes to firmly hold your load on hills. Patented 4 sided E-Strap attachment holds cargo firmly to Dolly frame adding safety and protection of cargo. Best of all, their Made in the USA! Snap-Loc Cinch Strap 2"x8' w/Cam Red This Made in USA strap connects to itself allowing you to cinch items like pipe and lumber together in a bundle or for hanging something from your Shop and Garage ceiling. Great for landscaping to tie-up trees to stakes. Quick release Cam Buckle with 8 foot long strap will never leave you short. The sewn on Hook & Loop Fastener neatly store away strap when not in use and also secure excess strap during use. Heavy duty 2 inch wide Polyester strap webbing easily achieves the 3,000 lb. Break Strength rating (1,000 lb. working load) and will not wear out like those skinny and cheap import straps you get upset at because they are all tangled. Add our optional slip-on E-Fitting Positive Locking end and connect this strap to "Snaplocs" (E-Track Singles) and traditional E-Track. 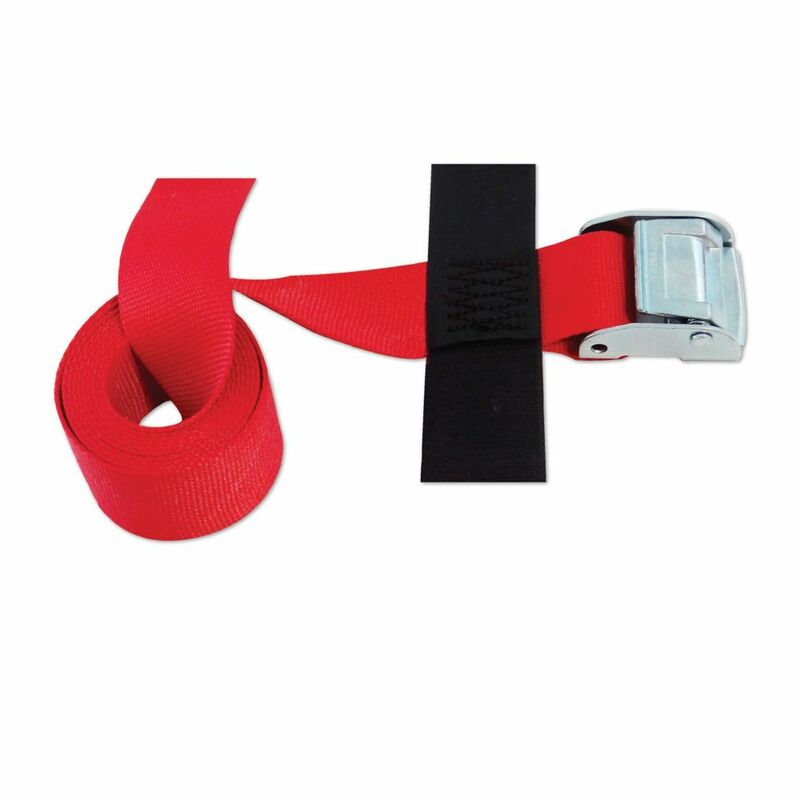 Snap-Loc Cinch Strap 2"x8' w/Cam Red is rated 5.0 out of 5 by 1. Rated 5 out of 5 by Navpreet from Solid feel. Easy to use! Bought these about 2 months ago and love them. Use them to secure a Dirtbike to a hitch mounted carrier. Easy to use. Love the wide face. It doesn't take much to "cinch" . As well, I love the velcro feature that allows you to roll up excess and so it's not flapping around in the wind everywhere and you don't have to tie it.